Hi, I'm Ed! And I'm a San Francisco Bay Area Headshot photographer (in addition to weddings, portraits, and fashion). Here are some SF Bay Area headshots I've done with a variety of people in the Bay Area including CEOs, CTOs, entrepreneurs, founders, managers, celebrity, and other professionals. I would describe my headshot style as contemporary that fits today's working Silicon Valley professional. It's also modern enough to use for your personal dating (ie. Tinder, Coffee meets Bagel, etc.) profile picture. My headshots will show your professionalism and approachability in your best light, and your best you when you decide to use it for personal use. I'm based in the San Francisco Bay Area. Scroll below to see more! Telerik Corporation's founders were coming to visit their satellite office in Palo Alto, California. The commissioned me to take the headshot photos of the whole office. We also took some three quarter shots of the founders interacting with each other. Check out their before images here, and the after images below. Contact me if you want updates to your photos! Daedalus Structural Engineering wanted a particular background to suit their company. This was taken at a bus stop they designed in West Valley College, Saratoga. It had had a concrete wall which was appropriate for a structural engineering firm. Bohannon Companies needed an update to their headshot photos. See their before images here. Agoric does smart contracts / crypto for markets! We took these headshot photos of Dave and his law associates at the back side of his law office in San Jose. South Bay Orthodontics - everyone has such pretty teeth! 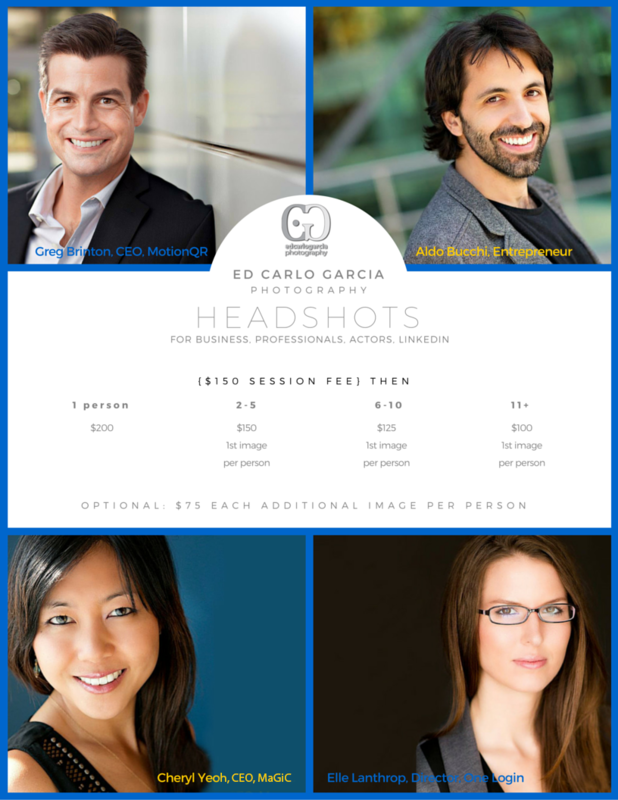 Headshots are $350 for a 15-30 minute session and it comes with 3 versions of 1 retouched image (print ready, web, and LinkedIn). There will be 25+ images to choose from and additional retouched images are $75. And here are the group rates. Tax applicable for the package and/or individual items if ordering physical items. Tax not applicable if digital only items are ordered. Travel fees may apply within the Bay Area if outside the service area. Please inquire for a travel fee quote. Prices are subject to change unless the client books in advance. Booking requires a retainer to save the date and time for photography. Limits apply to how far in advance a photo session can be booked.